Redhill continued to see a lot of activity over January, with Emile Esterhuizen managing to climb "Elfen Lied", an 8A traverse and then continue to link it into the problem's reverse (dubbed "The Untitled Symphony of Self-destruction, a 7C+ on it's own). The result was a 25 move traverse which was jokingly named "There and Back Again by Emile Esterhuizen" and given an 8A+ traverse grade. Marijus Šmigelskis made a second ascent after adding a few new problems of his own. First to fall was "The Crazy 88", a powerful line through a roof, with hard pulls off small crimps and slopers which went at 8A. Next was "Black Hoodie Rap" 7C, which climbs the "Four Singers Extension" to join the crux dyno of "Shark Lord Darron". And finally, "Madness the Magnet" 7B+, a short burly problem sharing the same boulder as "The Crazy 88". Marijus on "The Crazy 88". 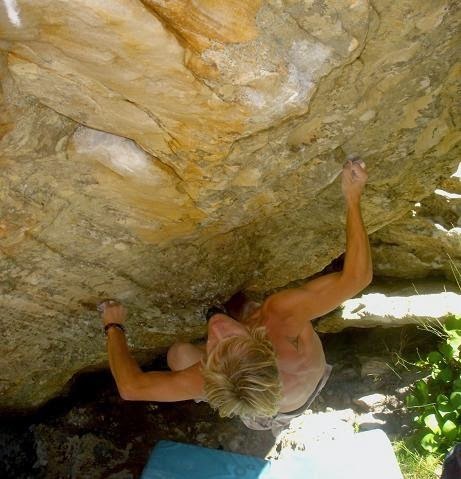 Emile continued his good sending form to send "Caveman" 7C at TDA. The lines starts as for "Invisible Monsters" and joins "THC" and is probably Cape Town's most popular 7C.